Create a workout using every day of the week that would normally have training. 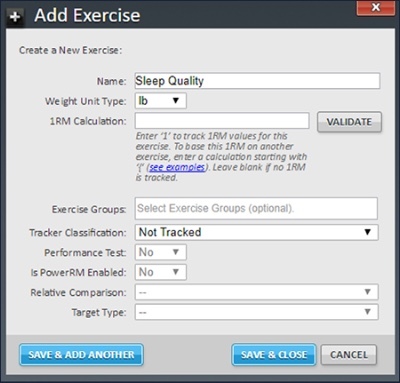 Add desired survey questions to that workout as Non-Trackable Exercises. 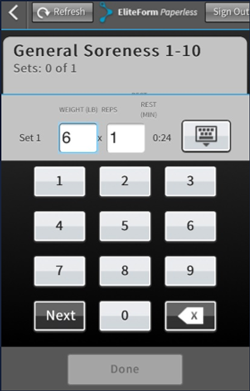 Assign these with one set of one rep.
Use the “Create From” feature as the template for all new workouts. The readiness questionnaire will appear at the top of each day’s Exercises. The rest of the day’s session can be programmed below. 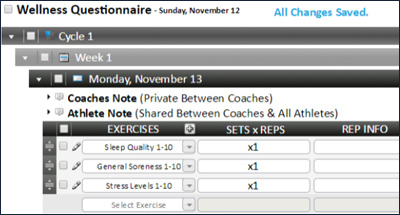 When Athletes begin their workout, they can “Edit Load” for those exercises to report their answers to the survey. These scores will appear in the Volume section of Daily Exercise Report and can be examined further by selecting ‘Details’ of each exercise that was used as a survey question. The ‘weight’ value is the Athletes reported score for that survey question.